Human resources (HR) concept. 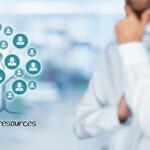 Human resources is a root of a tree in relationships with customers. Customers represented by icons.